What better way to celebrate with friends and family of all ages! during your Hen Party celebrations. making a memento of a special celebration. sewing takes about 60 � 90 minutes and then we take about 30 minutes to clear away. miles away from Sale mileage will be charged at 45p per mile. Parking is charged at cost. 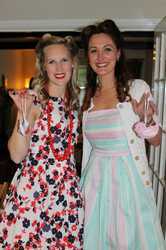 Garter Making - Perfect for a Hen Party!